TPO Roofing as it grows more and more has contributed to technical advances that can lower the on the Roof Cost, while still achieving a UL Class A Fire Rating (the highest rating available). TPO Roofing manufacturer’s particularly Carlisle Syntec have came up with cost saving methods or systems commonly referred to as “Hybrid” TPO Roofing Systems. Last week I was fortunate enough to attend Carlisle’s Sponsored Event at Top Golf here in Houston, Texas. One thing that really caught my eye was the Hybrid Combination of High Density Polyisocyanurate installed on top of EPS (Expanded Polystyrene) that enables mandatory R Values to be met at a lower cost than by just using Polyisocyanurate alone. 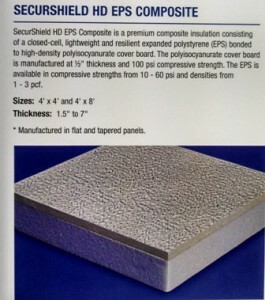 Carlisle has came up with their, “Secureshield HD EPS Composite”, which when incorporated into either a New Construction TPO Roofing System, or a Retro Fit TPO Roofing System. It is available in widths from 1.5” to 6” and with a R Value of R6.5 to R30.5, and when incorporated into any TPO Roofing System, or any Single Ply System, is a great way to reduce total system cost. I have attached a picture for review. TPO Roofing membranes are now also available in SAT (Self Adhered Technology) reducing the need for glue, and decreasing labor expenses. I watched a video of 7 astute TPO Roofing installers that were filmed and clocked at 42 Minutes to install a 10’ x 100’ roll of TPO Roofing Membrane fully adhered with TPO bonding adhesive. The same crew was then filmed installing a roll of 10’ x 100’ SAT TPO Roofing membrane fully adhered and it took them less than half the time. As TPO Roofing becomes more and more competitive having manufacture’s like Carlisle Syntec and their sister company Versico always working in research and development to make better performing lower Costing TPO Roofing Systems is something that not only benefits the Certified Applicators, but also the potential clients through being able to provide them a TPO Roofing system, at a lower price that still meets or exceeds all applicable codes and is Warrantable as a total system for a Long Term, non prorated. 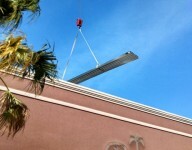 TPO Roofing and the technical advances that allow for a lower on the Roof Cost, may take a little while to see full integration; however the Commercial Roofing Contractor that can grasp these advances, explain them to potential clients, and implement them into the systems they specify have a advantage that could make the difference in closing a deal or losing a deal. As TPO Roofing continues to gain market share knowing more competitive way to specify a TPO Roofing System, by reducing both material and labor cost can only help to assure your success as a TPO Roofing installer, or any Single Ply Roofing system for that matter.